I manage to go 1utama today & check out the situation there. Seems they're pretty stock compared to Stila KLCC. Manage to get some of the items my friends asked me, that includes the very much sought after Smudge Pot Trio Set that costs rm70. It comes with a mini eye liner brush and 3 smudge pot (eye liner gel) in black, bronze and grey. They still have colours that I wanted for their convertible eyecolor which is a eyeshadow duo in one and has a smudge brush at one end. It's a fantastic eye thingy in one applicator. I shall review about it later after dinner. I have a feeling I need to review what is good to grab before everythings runs out. I got the famous stone colour for this at RM45. I use it as a eye liner, eye shadow. Day to night look can be done with this too. 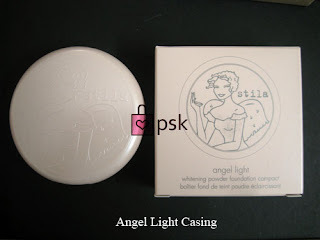 Almost forgetting that Stila has actually discontinue their Angel Light range last year or earlier but I manage to buy the angel light whitening refill powder at Stila KLCC for rm40 (retail RM110 for just refill! omg). No casing to be seen until I asked at Stila BU. So happy! the casing is a sweet angel light design in white for RM20 (it's RM45 retail for casing). I shall end this short & sweet post on swatches I done with the smudge pot set at Stila BU. The Bronze is a very nice brown colour kinda like stone (convertible eye color stone). The grey is ok ok can work with it and black is popular. I had these swatches on my hand since morning until now and they're still on my hand and did not smudge off or fade! even after I wash my hands many times after going to the toilet (eee... haha). *I hope u girls don't forget about the kajal eyeliner sharpener?? The Simple Guide for your Eyes. using the Stila's convertible eye color. and the e/s spill out! bkful! 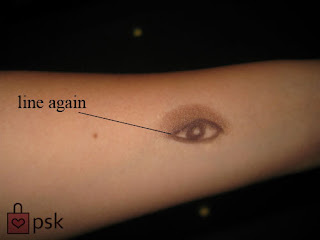 OK u must be wondering why I draw an EYE on my hand? sorry my house lighting very bad, I tried to take pic of my eyes but very dark! when I use flash, I looked like Sadako from the Ring! 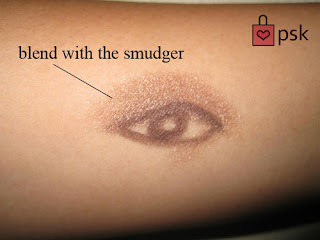 SO I decided to draw on my hand an eye using the convertible eye liner and smudge it with eyeshadow to create the look. HAHAHA!!! 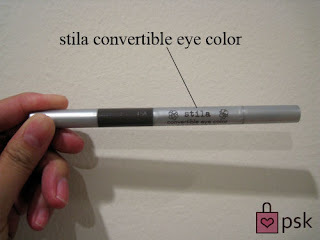 In short, the Stila Convertible Eye Color is a 3 in 1 eye tool. 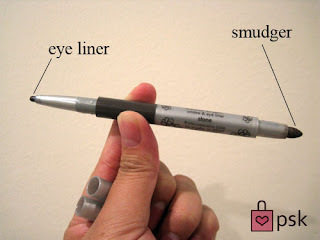 It has eye liner, eyeshadow pigments (preloaded in the middle with a bud like brush) and a smudger on the other end. Each convertible eye color has different eyeshadow colors to blend with. You can test it at the counters. 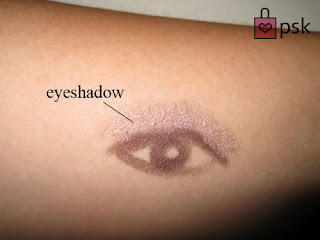 Stone color has a pearly shimmers that turns smoky shimmery brown when u blend it together with the eyeliner color. 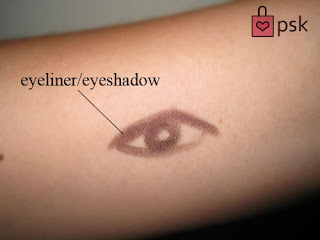 A simple tool to make up from day to night with easy blending and smudging. Of coz dun forget mascara your lashes ok?! "I got the famous stone colour for this at RM45. I use it as a eye liner, eye shadow. Day to night look can be done with this too." can show how to do the LOOK? n which product is that? Hi Von forgotten u wanted 3, i took 5 i think enough cover everyone including your 3 sets. lola: it's the convertible eye color, i shall post up a review later on it. U can do a simple day - night with it. eh dun have e/s palettes already? this morning sa told me still got. 4 boxes left? wow that's fast.. thought i can go grab somore. but nvm. Chuisy confident that stock will come in soon. Just reserved with her what u want. Vonvon: tentatively 2 box for u coz i wan keep 2 box myself too. If got extra i give to u yap! Chat with you tomorrow, ok? wah so stress lah have shopaholic friends! ish ish..
lucky i grab 5 box and now it seems all the 5 belong to u girls at the end of the day. Vivian: can let me know what u have order? i duwan get extra when u have order, later SA marah. What else u r looking for? convertible i got extra stone color, if u wan u can ambik from me. Cherry crush get from me too. Smudge Pot set did u order? did u order at 1utama also? coz i heard the 1u SA told me my fren reserved. I duno which fren LOL. If u have reserve, then ur set is there. If u haven't i can let go one set to u.
miu,so now which counter still have smudge pot set? Stila KLCC left some eye liner brush rm20-30. But i din take lah..
miu ar post more products pls with price it will help me with writing down my paper b4 i go ROB stila stall , the kajal liner how much ar? i going again 3rd round ding ding damage currently reaching 1k+++ got any AH LONG here can borrow me money buy stila ar??? seriously.. ur hubby said that? i hereby confirm he is part woman..
prettybeautiful: a lot of girls swear by smudge pot! u should get 1 and try! :) i test it whole day yesterday from morning to sleeping. With heat, sweat, water, working still on my hand! i guess it looked funny to strangers when i was at lunch too with 3 black/brown colors on my hand... uh..
i spend 3.6k already.. get nothing..
btw.. u got BU contact or not? if u have see smudge pot set,help me buy 2 set,ok? I picked up one of the Smudgepot trios at the 1U outlet on Monday, but didn't get much else cos everything I wanted was out of stock. I saw the old Kitten Palette on display and wanted to get it, and one SA told me it's RM75 - I asked her whether she's sure since nothing else there is over RM70...then she was like "err..ah..it's RM70". Then the OTHER SA walked over and said "oh, that one not for sale, display only". ehhe tq for let go one day to nite look..
haze: i think its great for any skin color as a eyeliner/shadow. It's natural, perks up your eyes. My eyes single lid small sepit, when use looked bigger. I order a few in onyx and stone. See got come or not the stock. Will let u know u can choose if my order come. beetrice:isetan@gardens only have one sa,others girl just help stila,they not very sure the price,many things was gone..
the white shirt girl is stila one,others black shirt is other brand..
miu:i really 4get the sharpener...omg..sa didnt ask me ler....n how abt lipglaze stick?they also have sales sharpener for this? Owh really? Cool then. I have to admit i'm a Stila newbie.. never owned anything Stila before, so i'm tempted to try one. 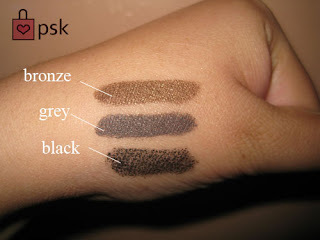 The Onyx shade's eye pigment is in what tone? silvery grey? The Stone shade's pigment looks bronze to me.. nice natural color... huhu. Are Stila's compact powders any good? Am thinking perhaps its better to get my sister a stila powder instead... huhu. What's the discounted price like eh? Waaa...din know they had so many cosmetics case. I so want the Stila cosmetics cases and bags so much. all their accessories i so want. Miu, the drawing of the eye very nice, very real, shows out the stone colour very well. think gonna get the stone colour also. 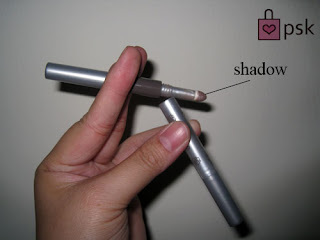 Hey miu, do u happen to know anywhere where they still have the stila kajal liner pencil in Onyx? I really really want one!!! miu~if u happen to go to shop stila, boleh help belikah ? hw long cn the make up be stock?? Eh, why Stila marked down price? Is it becoz they're 'refinancing'? I reah in the net that Stila mau bankrap.Is it true? Stila U.S has some problems, it could be selling the brand to some other companies, trying to stay alive in the current economic situation etc. One things for sure is LuxAsia in MY & SG is not going to sell Stila anymore. I hope some other companies take over.